There are three main elements to System T: a Dante AoIP based Routing & I/O system which combines SSL’s own Dante ready Network I/O range of audio interfaces with over 1000 third party Dante enabled products, Tempest based rack Processors that deliver the most powerful and versatile audio processing engine available today, and control interface technology that combines a range of consoles with remote hardware, software and touch screen technology. SSL has nearly four decades of classic audio console design legacy with many of the hardware and software control surface paradigms taken as standard today having first appeared on an SSL console. System T takes this DNA and creates a new broadcast specific set of Control Interfaces that combine hardware panels with large tablet style multi-touch screens in a fully networked environment. Fixed format compact consoles and modular large format consoles can be combined with remotely located computers, or touch screen terminals and remote hardware panels. Up to three Control Interfaces can share a single processor engine simultaneously, facilitating for example, an entertainment production with one surface for a music mix and a second for a production mix using a single engine. Multiple engines can be connected to a single console VLAN and interfaces can be moved between engines. The various approaches to remote control capability enable true facility wide control infrastructure design. With System T, Dante AoIP network technology (with complete AES 67 capability) replaces traditional TDM routing with an ecosystem that offers a wide range of operational and commercial benefits. Dante is a licensed IP Audio Network technology which uses standard IT infrastructure for audio transport, routing, device discovery and control. Dante is high capacity, incredibly versatile and fully scalable. A single gigabit network connection can carry 512 audio channels at 48kHz, or 256 channels at 96kHz. With 512 audio channels bi-directionally on a 1GB connection, a single 24 Port GB Switch is capable of equivalent routing capacity to a 12,288 by 12,288 TDM router at a fraction of the cost. Expansion of a network is not subject to the square law growth required when expanding TDM routing systems; additional switches and capacity can be deployed without replacing core hardware. Dante offers fully inter operable system design; over 350 licensed development partners with more than 1000 devices commercially available enabling you to select and combine devices from different manufacturers. 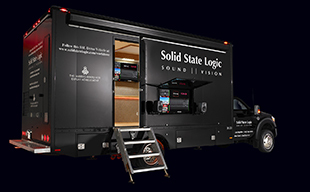 The system includes full current AES67 and future ready SMPTE 2110-30 audio transport capability. 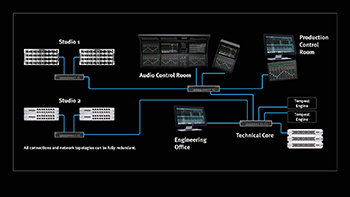 System T offers full routing control of the Dante network from within our consoles and control interfaces. Routing control can be achieved from an unlimited number of devices or network terminals. Dante employs full plug and play device discovery enabling devices to be moved around the network and re-connected with settings intact. Fully redundant network topologies widely used and proven in many IT applications provide the security required for Broadcast infrastructures. SSL Network I/O interfaces bring renowned SSL audio performance to Dante networks. They can be used as standalone solutions or used with System T to complete powerful facility wide systems. 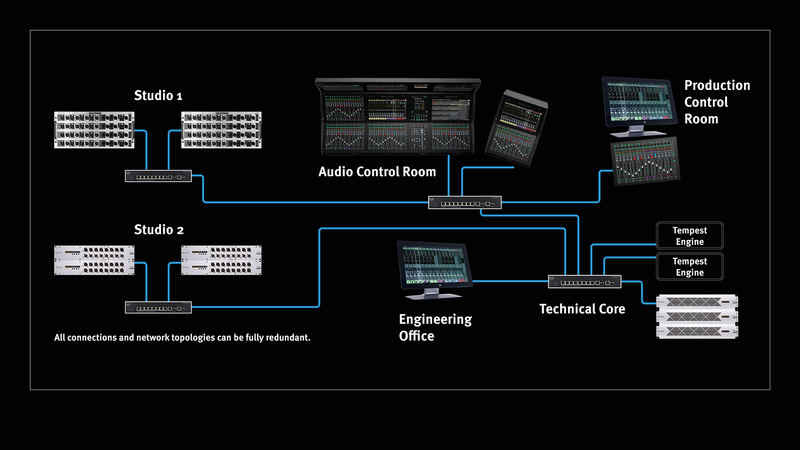 Five different devices offer mic/ line analogue, MADI, AES and SDI embed/de-embed capability wherever it is required. System T Control Interfaces and SSL Dante Control Software offer remote control over SSL mic/line I/O across the network. Tempest processor engines deploy SSL’s patented Optimal Core Processing (OCP) software using arrayed industrial PC hardware in a controlled operating environment. Housed in a 4RU chassis there are two different Engines available, The T80 (offering 800 path capacity) and the T25 (offering 256 path capacity). Paths and processing can be dynamically allocated in real time without interrupting audio. With 3072 inputs and 3072 outputs per engine, System T can handle any large-scale production. Tempest engines can be deployed as mirrored redundant pairs and if required each engine can be placed in separate fire zones. Near instant audio changeover happens via up to 6 Network I/O HC bridging cards, each providing 512 channels of inputs and 512 outputs.